They are thin, light-weight, flexible and can be produced cost- and energy-efficiently: printed microelectronic components made of synthetics. Flexible displays and touch screens, glowing films, RFID tags and solar cells represent a future market. In the context of an international cooperation project, physicists at the Technische Universität München (TUM) have now observed the creation of razor thin polymer electrodes during the printing process and successfully improved the electrical properties of the printed films. Solar cells out of a printer? This seemed unthinkable only a few years ago. There were hardly any alternatives to classical silicon technology available. In the mean time touch screens, sensors and solar cells can be made of conducting polymers. Flexible monitors and glowing wall paper made of organic light emitting diodes, so-called OLEDs, are in rapid development. 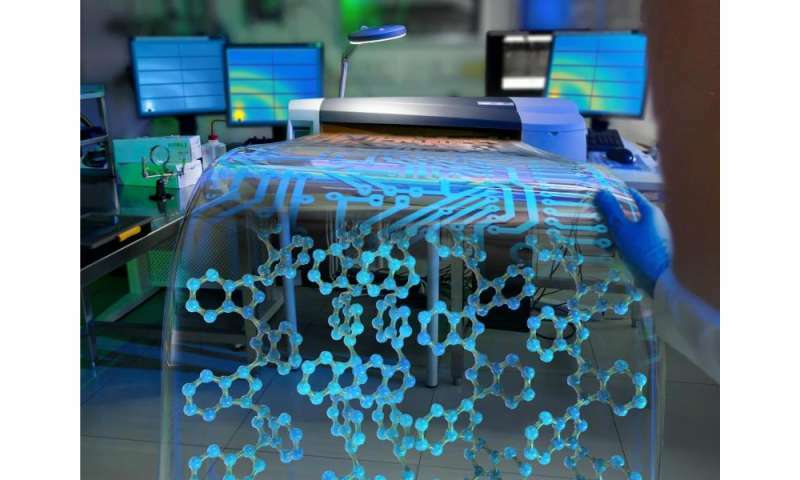 The "organic electronics" are hailed as a promising future market. However, the technology also has its pitfalls: To manufacture the components on an industrial scale, semiconducting or insulating layers - each a thousand times thinner than a human hair - must be printed onto a carrier film in a predefined order. "This is a highly complex process, whose details need to be fully understood to allow custom-tailored applications," explains Professor Peter Müller-Buschbaum of the Chair of Functional Materials at TU München. A few months ago, researchers from the Lawrence Berkeley National Laboratory in California for the first time succeeded in observing the cross-linking of polymer molecules in the active layer of an organic solar cell during the printing process. In collaboration with their colleagues in California, Müller-Buschbaum's team took advantage of this technology to improve the characteristics of the polymer electronic elements. "Thanks to the very intensive X-ray radiation we can achieve a very high time resolution," says Claudia M. Palumbiny. In Berkeley the physicist from the TUM investigated the "blocking layer" that sorts and selectively transports the charge carriers in the organic electronic components. The TUM research team is now, together with its US colleagues, publishing the results in the trade journal Advanced Materials. "In our work, we showed for the first time ever that even small changes in the physico-chemical process conditions have a significant influence on the build-up and properties of the layer," says Claudia M. Palumbiny. "Adding solvents with a high boiling point, for example, improves segregation in synthetics components. This improves the crystallization in conducting molecules. The distance between the molecules shrinks and the conductivity increases. In this manner stability and conductivity can be improved to such an extent that the material can be deployed not only as a blocking layer, but even as a transparent, electrical contact. This can be used to replace the brittle indium tin oxide layers. "At the end of the day, this means that all layers could be produced using the same process," explains Palumbiny. "That would be a great advantage for manufacturers." To make all of this possible one day, TUM researchers want to continue investigating and optimizing the electrode material further and make their know-how available to industry. "We have now formed the basis for pushing ahead materials development with future investigations so that these can be taken over by industrial enterprises," explains Prof. Müller-Buschbaum.